The average characteristics of conventional mortgages used to buy newly built homes were little changed in April, according to data released earlier today by the Federal Housing Finance Agency (FHFA). The average contract interest rate declined a scant 2 basis points to 4.19 percent, while the average initial fees and charges increased by a single basis point to 1.22 percent. As a result, the effective interest rate (which amortizes initial fees over the estimated life of the loan) also declined by 2 basis points, to 4.33 percent. Meanwhile, the average size of the conventional mortgages used to purchase newly built homes increased from $322,600 to $325,800 in April, while the average price of the new homes purchased with the loans went from $427,200 to $434,500. This is the second consecutive month during which both the loan size and new home price both increased, although neither is yet quite back to the peak it reached in January. This information is based on FHFA’s Monthly Interest Rate Survey (MIRS) of loans closed during the last five working days in April. For other details about the survey, see the technical note at the end of FHFA’s May 29 new release. Earlier today, the Federal Housing Finance Agency (FHFA) reported an 8 basis point decline in mortgage interest rates between February and March. However, the decline was due entirely to loans on existing homes. 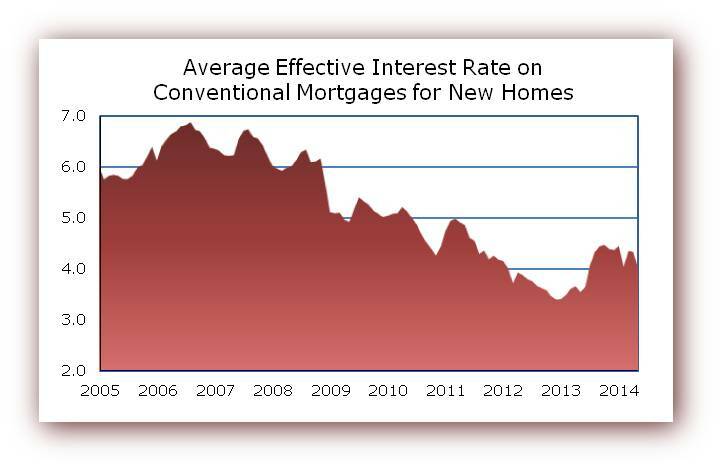 The average contract interest rate on conventional mortgages used to purchase newly built homes actually increased in March, from 3.91 to 4.21 percent, reversing an anomalous drop to under 4 percent that occurred in February. Initial fees dropped on mortgages for both new and existing homes in March, but not enough to offset the movement in contract rates on new home loans. After amortizing initial fees over the estimated life of the loan, the effective rate on new home loans increased from 4.04 to 4.35 percent, moving back into a range typical of the latter half of 2013. The average price and loan size on conventional mortgages used to purchase newly built homes also reversed previous month declines in March. The average price increased 5.4 percent to $427,200—the second highest number on record. Meanwhile, the average size of a loan used to purchase a new home increased 7.1 percent to $322,600, also the second highest number on record. 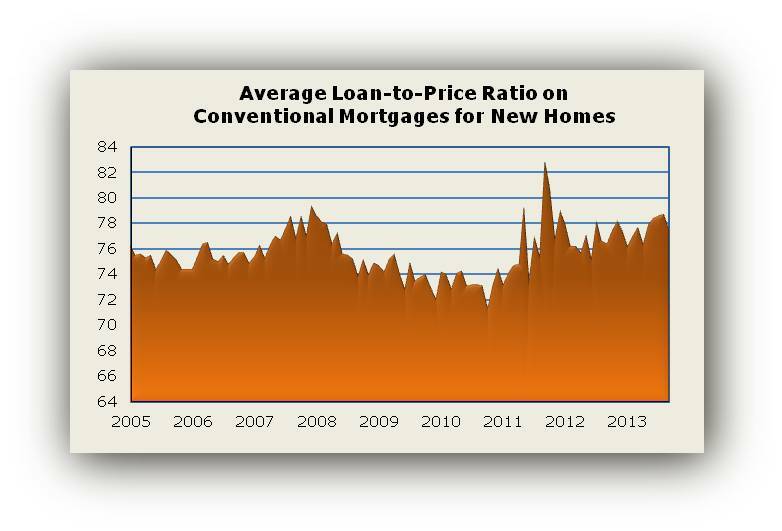 As the above numbers imply, the average loan-to-price ratio increased in March, from 76.6 to 77.5 percent. Again, this reversed a decline reported for the previous month. This information is based on FHFA’s Monthly Interest Rate Survey (MIRS) of loans closed during the last five working days in March. For other details about the survey, see the technical note at the end of FHFA’s April 29 news release. Earlier today, the Federal Housing Finance Agency (FHFA) reported a slight (3 basis point) rise in mortgage interest rates for December. 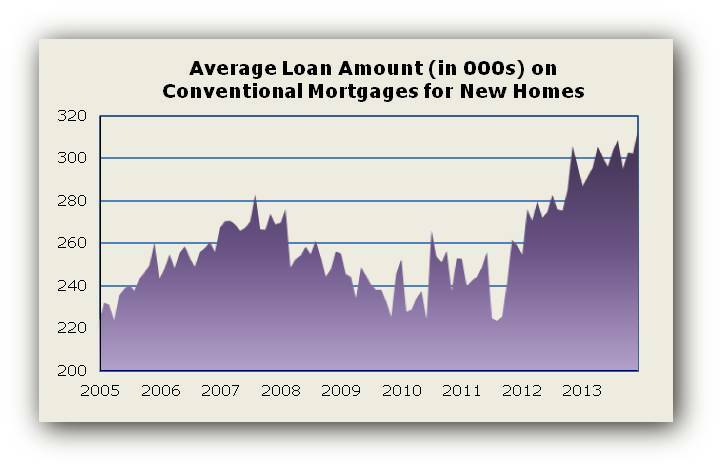 However, the rise was driven entirely by loans used to purchase existing homes. 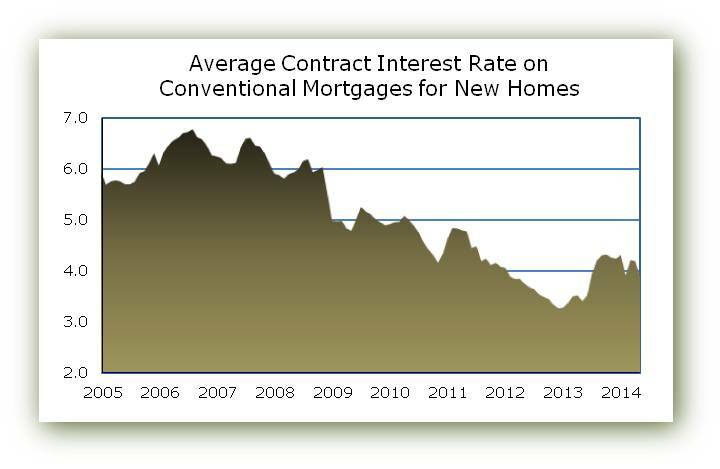 The average contract interest rate on conventional mortgages for new homes actually moved slightly in the opposite direction from 4.26 to 4.24 percent. Initial fees, which have the potential to offset a small change in the contract interest rate, edged down on mortgages for both new and existing homes. 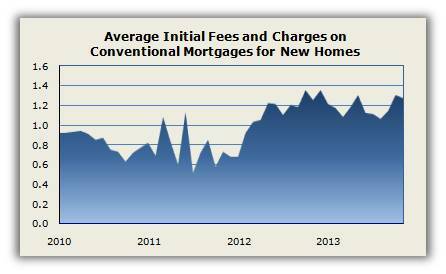 On mortgages for new home loans, the decline in initial fees was from 1.27 to 1.22 percent. The result was a decline in the average effective interest rate on new home loans (which amortizes initial fees over the estimated life of the loan) of 2 basis points to 4.24 percent, the lowest it’s been since August. While the interest rate changes were very small, the average size of conventional mortgages used to purchase new homes, as well as the price of the new homes purchased with the loans, made notable gains. The average loan size increased 3.8 percent to $313,400, which represents an all-time high. 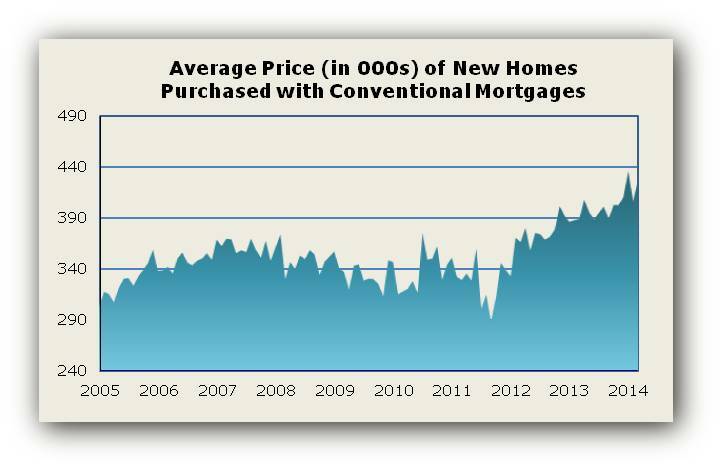 Meanwhile, the average price of a new home purchased with a conventional loan increased 1.9 percent to $409,500, also an all-time record (although it was nearly as high in April of 2013). Because the average loan amount increased by more than the average new home price, the average loan-to-ratio price also increased, from 77.4 to 78.3 percent. This information is based on FHFA’s Monthly Interest Rate Survey (MIRS) of loans closed during the last five working days in December. 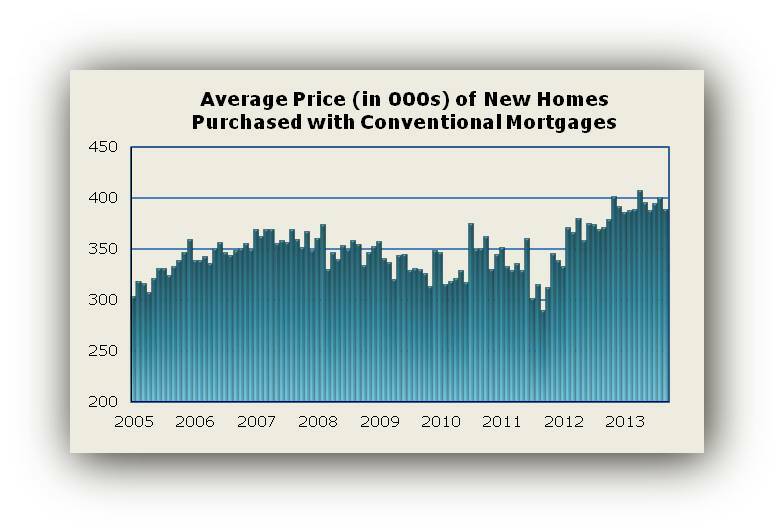 For other details about the survey, see the technical note at the end of FHFA’s January 30 news release. On Christmas Eve, the Federal Housing Finance Agency (FHFA) reported a 10 basis point decline in mortgage interest rates for the month of November. Data from FHFA’s Monthly Interest Rate Survey (MIRS) cover conventional single-family mortgages and distinguish whether the loans are for the purchase of new or existing homes. 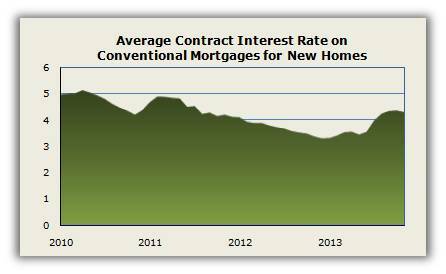 In October, rates on existing home loans declined while rates on new home loans stubbornly continued to inch up. But in November, rates on both types of loans declined. 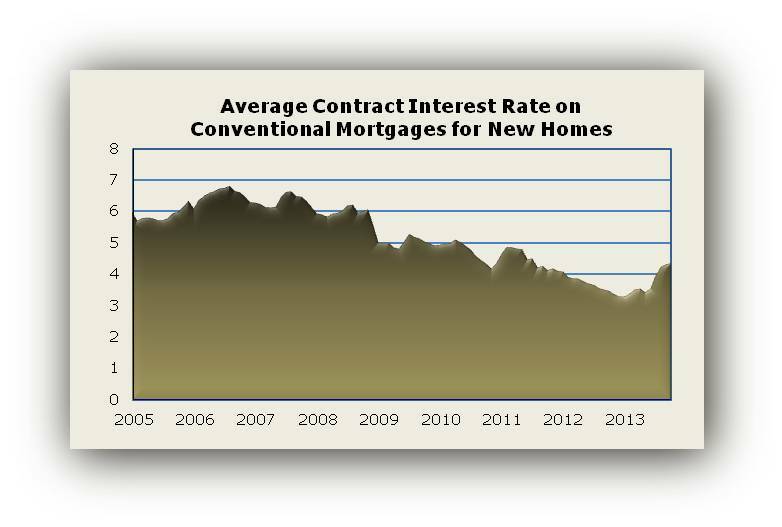 In particular, the November data show a 6 basis point decline in the average contract interest rate on loans to purchase newly-built homes, from 4.32 to 4.26 percent. 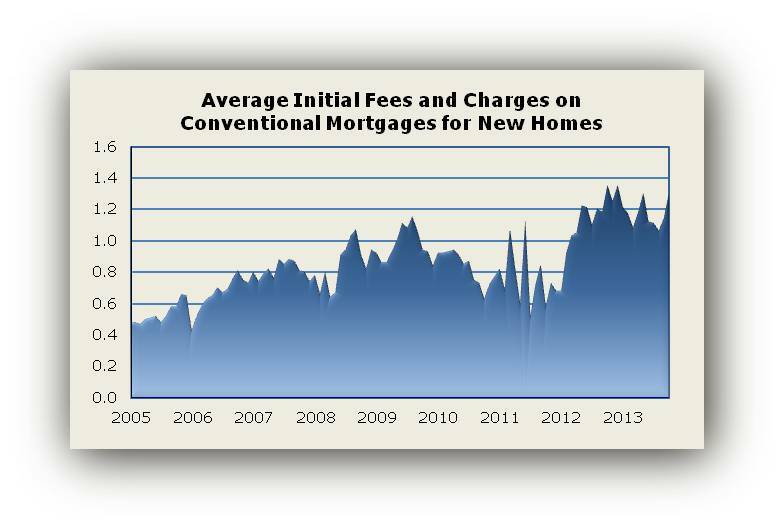 Initial fees have the potential to offset a decline in the contract interest rate, but the initial fees on mortgages for new homes also declined in November, from an average of 1.30 to 1.27 percent. (Although down from October, this is still relatively high by historical standards, as the average fee on new home loans has only been as high as 1.27 percent five times since 1996.) 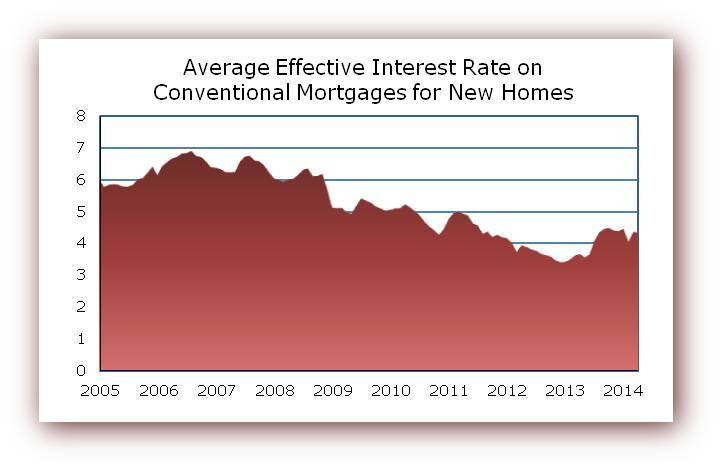 The combination of declines in the contract rate and initial fees took the average effective interest rate on new home loans (which amortizes initial fees over the estimated life of the loan) down 8 basis points to 4.39 percent (after two consecutive months above 4.40). 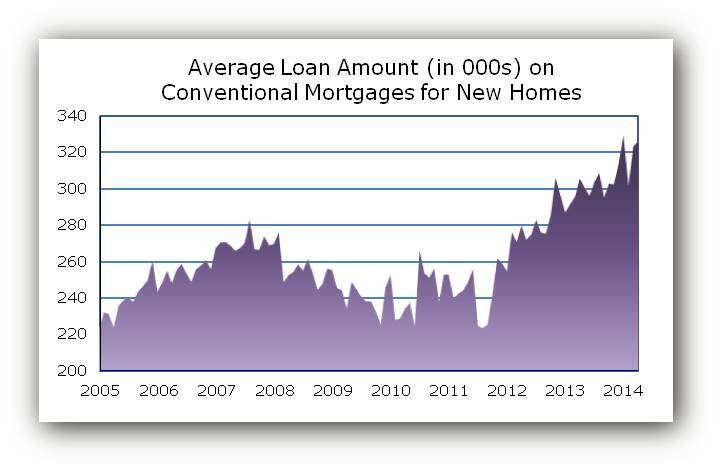 The November data on conventional new home mortgages showed relatively little change in the average size of the loans ($302,000), the average price of the homes purchased with the loans ($401,800), or the average loan-to-price ratio (77.4 percent). The MIRS collects data on loans closed over the last five working days of the month. For other caveats and survey details, see the technical note at the end of FHFA’s December 24 MIRS release. Earlier today, the Federal Housing Finance Agency (FHFA) reported a 4 basis point decline in mortgage interest rates for the month of October. However, the decline was driven entirely by loans on existing homes. 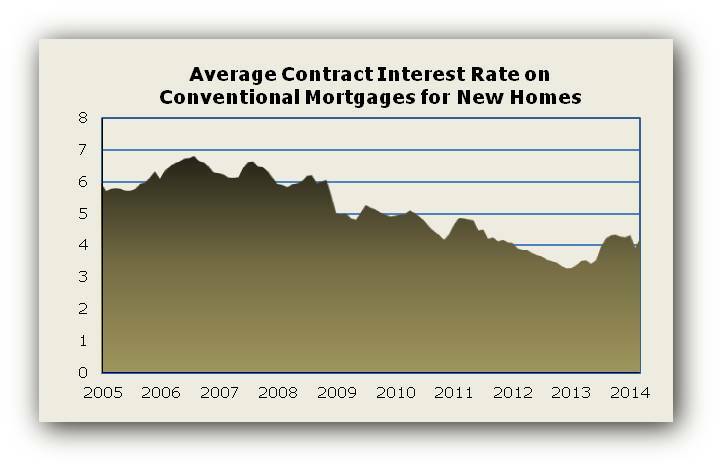 The average contract interest rate on conventional mortgages for new homes stubbornly refused to follow suit, moving instead in the opposite direction from 4.30 to 4.32 percent. Although this technically continues the upward trend of the previous four months, October’s 2 basis point change is small and represents a substantial leveling off from the June-September increases that averaged 22 basis points a month. Initial fees have the potential to offset a small increase in the contract interest rate, but the initial fees on mortgages for new homes also increased in October, from 1.14 to 1.30 percent. This is the fourth time fees on new home loans have hit 1.30 percent (or higher) since October of last year (following an extended period when they remained below 1.30 every month from the start of 1997 through September of 2012). As a result, the average effective interest rate on new home loans (which amortizes initial fees over the estimated life of the loan) increased by 3 basis points to 4.47 percent, the highest it’s been since July of 2011. Also in October, the average size of conventional loans used to purchase new homes—as well as the price of the new homes purchased with the loans—reversed the previous month’s declines. The average loan size increased 2.6 percent to $302,500, while the average home price increased 3.4 percent to $401,800. 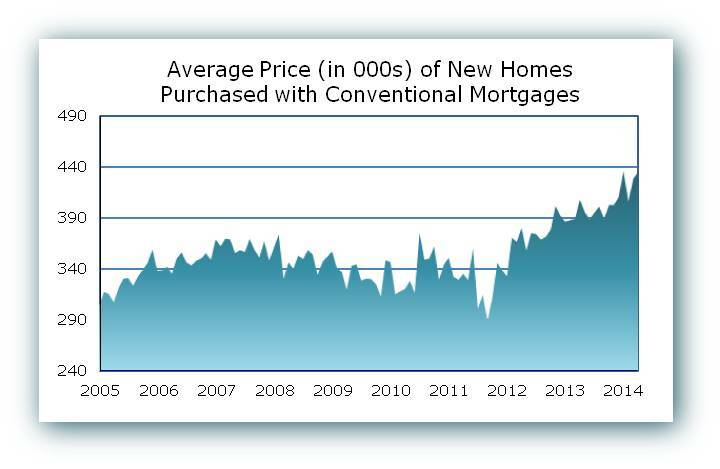 This marks only the third time in its history that the average price of new homes purchased with conventional loans has been above $400,000. The result of the price and loan size changes is an average loan-to-price ratio that declined for the second month in a row, from 77.5 to 77.1 percent, the lowest it’s been since March. The above information is based on FHFA’s Monthly Interest Rate Survey (MIRS) of loans closed during the last five working days in October. For other details about the survey, see the technical note at the end of FHFA’s November 26 news release. 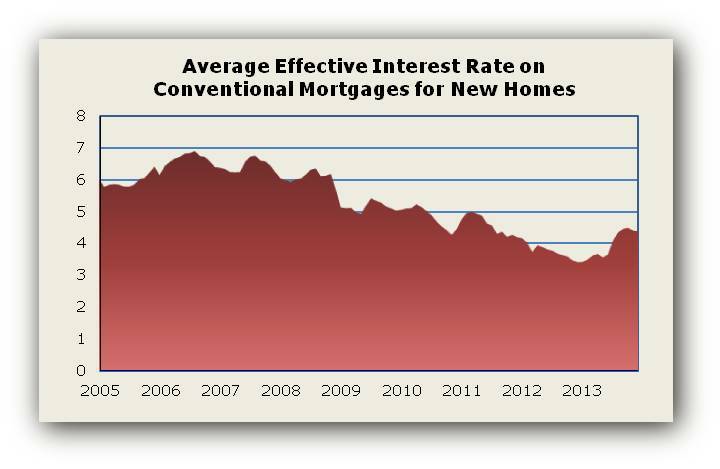 In September, interest rates on conventional mortgages used to purchase newly built homes increased for the fourth month in a row, according to data released today by the Federal Housing Finance Agency (FHFA). During the month, the average contract interest rate increased by 10 basis points to 4.30 percent, while initial fees increased to 1.14 percent (from an average of 1.06 percent the previous month). The combination drove FHFA’s key measure of the average effective interest rate on new home loans (which amortizes the initial fees and incorporates them into the rate) up by 11 basis points to 4.44 percent—the highest it’s been since July of 2011 (the month prior to a substantial 36 basis point drop). The FHFA release also includes data on loan size and house prices, and the averages on both for newly built homes declined in September. 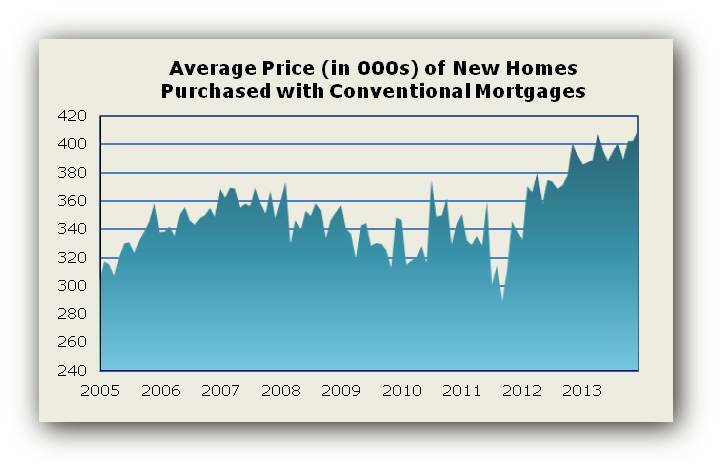 The average price of a new home purchased with a conventional mortgage declined by $11,900 to $388,500. (The average price depends on the mix of new homes purchased with conventional loans during a particular month, in addition to anything that may be happening to house prices in general.) The average amount of the loans showed an even more pronounced decline of $13,500, taking it down to $294,800. 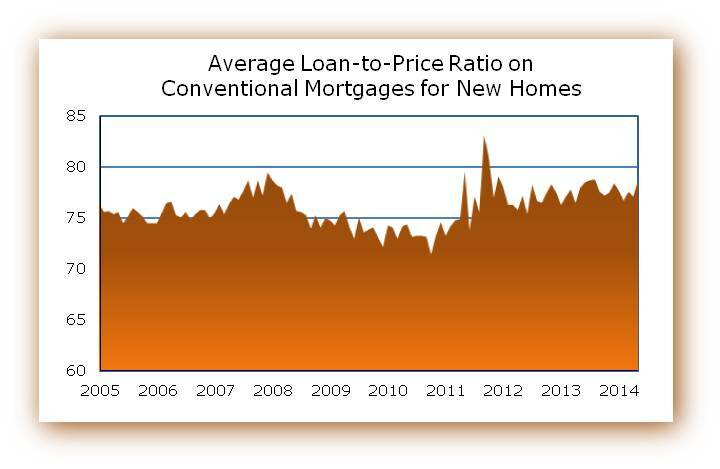 As the above numbers imply, the average loan-to-price ratio on conventional mortgages used to purchase new homes also declined in September—down to 77.5 percent, after three consecutive months during which it remained above the 78 percent mark. This information is based on FHFA’s Monthly Interest Rate Survey (MIRS) of loans closed during the last five working days in September. Rates and other terms on loans are usually set 30 to 45 days before the loans actually close. For other caveats and limitations of the survey, see the technical note at the end of FHFA’s October 29 news release.